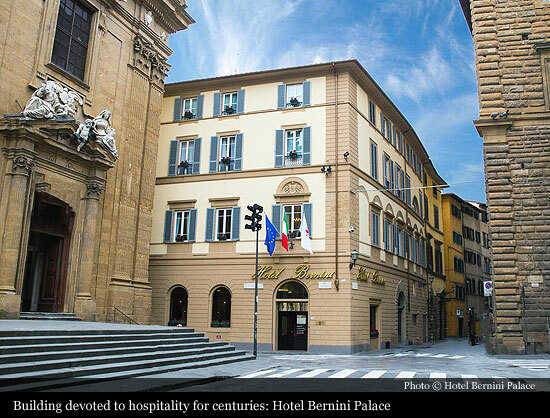 The Bernini Palace Hotel stands at the very heart of Florence, behind Piazza della Signoria and the Uffizi Gallery, just a stone’s throw from Palazzo Vecchio, the Michelangelo’s statue of David and the Porcellino market. 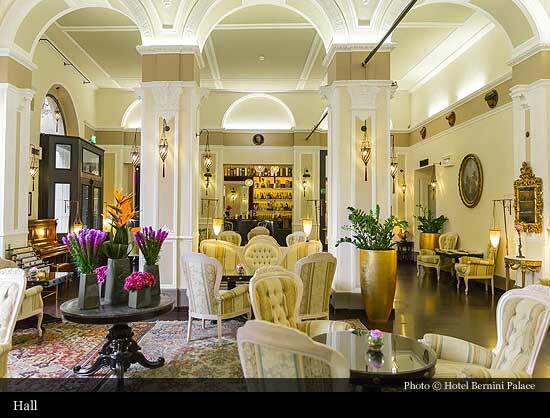 The building of the hotel dates back to the fourteenth century, when it was owned by the famous family Pera, ancestors of the historic family Peruzzi, who took over the Greeks after they had fallen into ruin: they were powerful financiers with enormous interest all over Europe. On the side of the Via dei Leoni / Piazza della Signoria, the hotel wall - a marble plaque - recalls the fortune of a family that was rich and powerful at the time of Dante: "The gateway, named from those of Pera, led into the narrow circuit of your wells" (Paradiso, Canto XVI). In Via dei Leoni you can still identify the succession of arches, the same ones from the first floor of the fifteenth century building. 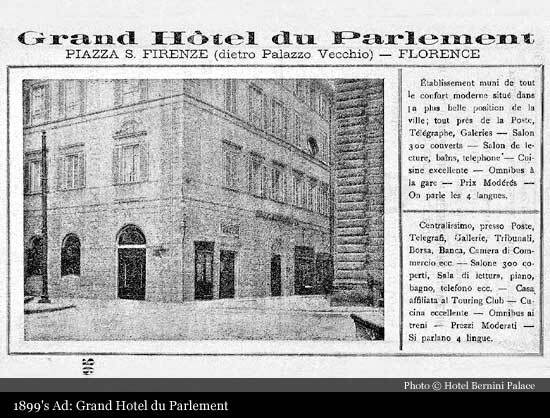 For centuries, the building has devoted to hospitality: in the seventeenth century it was the only hotel in Florence with running water and a shelter for animals, while in the mid-nineteenth century the palace was an elegant hotel, known as Hotel of the Shield of France. But only when Florence was the capital of the Kingdom of Italy (1865-1871), it had its greatest moment of glory. 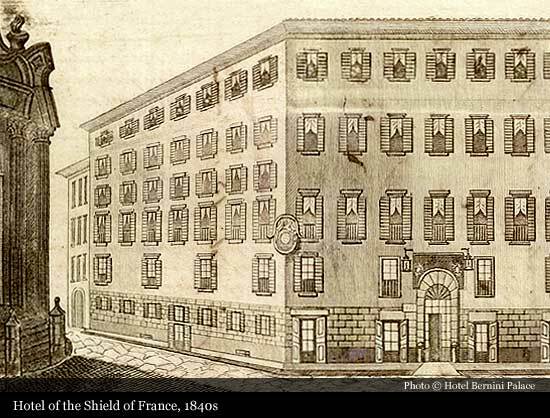 The Shield of France becomes Columbia Parlamento Hotel. 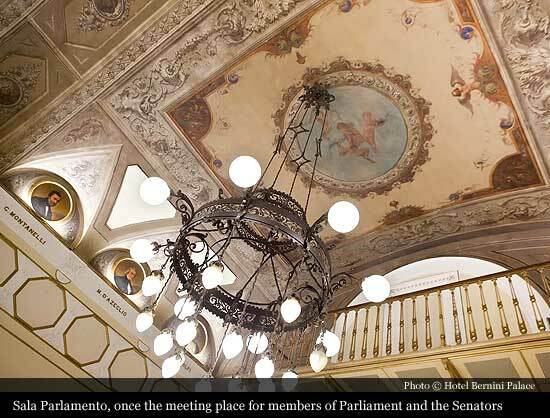 Thanks to its convenient location, it was a place to meet for the members of the House of Parliament, who gathered at Palazzo Vecchio, and the senators, who gathered at Palazzo Pitti. Some members chose it as their permanent residence, others came here especially at mealtimes, for long informal discussions by establishing alliances and making agreements that marked the destinies of the first convulsive years of the Kingdom. The transformations of that time led to its current look: the architectural styles of Renaissance were opposed to the luxurious interiors, including velvets and damasks, up to the high standards of the rich Italian and European bourgeoisie. These special guests were treated with first-class service. 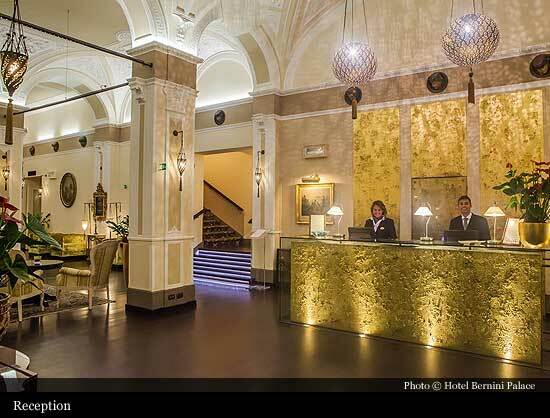 With the capital transfered to Rome the hotel lost fame, until the 80s of the twentieth century, when major renovation was initiated. The recovery process culminated in the discovery of the memories of nineteenth-century building, and finally a historical and real estate structure of greatest value returned to the city. One of the treasures of Bernini Palace Hotel, is a large frescoed room on the first floor with portraits of the protagonists of the Italian Unification. It was the Buvette of Parliament, and today it is a prestigious Hall of hotel breakfasts. Along the walls you can see the faces of the greatest people: Garibaldi, in the center, is surrounded by many Tuscan celebrities such as Nero Corsini, the last minister of the Grand Duke of Tuscany, Cosimo Ridolfi and Giuseppe Montanelli, Vincenzo Salvagnoli and Manfredo Fanti, but also famous people from Piedmont, Cavour and Brofferio, Balbo and Gioberti, Lamarmora and Valerio, Giuseppe Farina. One can also find Daniele Manin, in a tribute to the hero of the Republic of San Marco in 1849. However, Giuseppe Mazzini is absent for being too faithful to the ideals of Republicans to swear allegiance to the King and thus to be able to set foot in the Parliament. On the ground floor, during the restoration of the late eighties, a sixteenth-century open gallery was discovered, which had been almost completely hidden from view before. Another discovery was a series of niches decorated with female heads coiffed with curious hats, in memory of a former exhibition in the lobby of the hotel in the early 1900s. 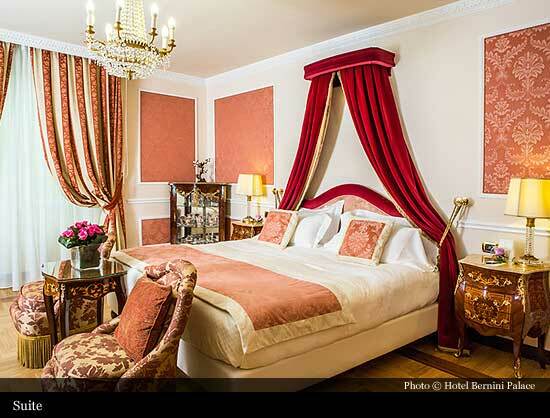 The Bernini Palace offers 74 rooms and 11 Suites. The first floor is furnished in a picturesque Tuscan style, combining Renaissance and Oriental styles, with terracotta tile floors, warm-toned furnishings and textiles, antique arrases, precious curtains and tapestries. 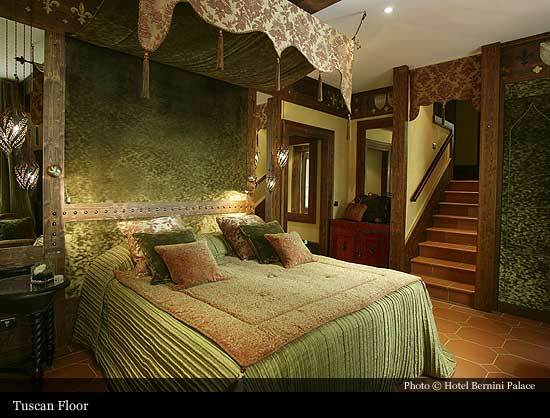 All of them are unique pieces, which are in tone with the beamed ceilings and four-poster beds. 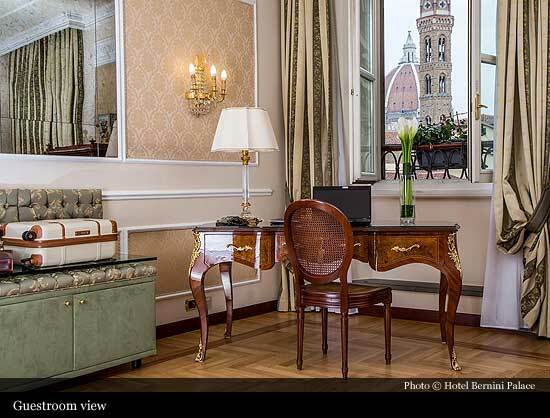 All rooms overlook the inner yards, alleys and paths of Medieval Florence. 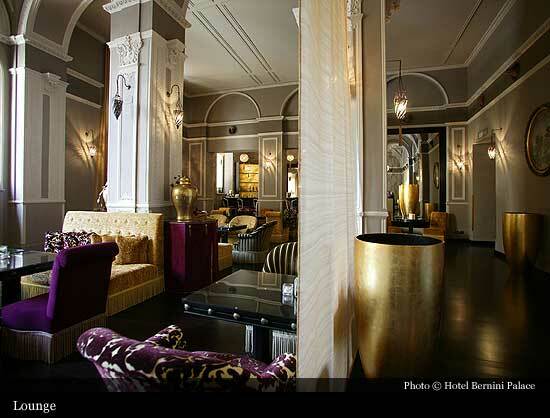 The Lounge Bar is an ideal haunt to drink a toast or arrange a romantic rendezvous. 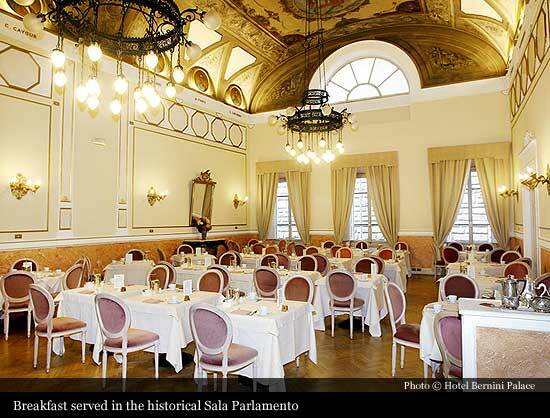 The recently restored hotel’s restaurant La Chiostrina is located near the lobby, under a XVI century colonnade at the ground floor. Located on Bernini’s rooftop it The Garden Terrace overlooking the Palazzo Vecchio.